a simple act of kindness; a greeting card. 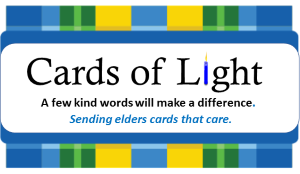 Create, decorate, and sign greeting cards to be delivered to local elders. Gather some blank cards, art supplies and volunteers and have some fun! A personally signed greeting can mean the world to someone living in a nursing home with little or no visitors.